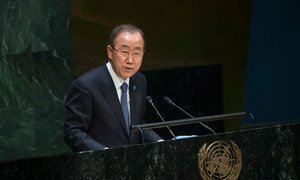 United Nations Secretary-General Ban Ki-moon today nominated an Advisory Group of Experts to conduct a policy and institutional review of the peacebuilding architecture and then to develop recommendations based on this work. Mr. Ban today announced the nomination of the following seven experts Mr. Anis Bajwa (Pakistan); Saraswathi Menon (India); Ms. Funmi Olonisakin (Nigeria); Mr. Ahmedou Ould-Abdallah (Mauritania); Mr. Charles Petrie (France); Mr. Gert Rosenthal (Guatemala); and Ms. Edith Grace Ssempala (Uganda). On 15 December, the Presidents of the General Assembly and the Security Council asked the Secretary-General to nominate up to seven experts to form an Advisory Group on the review of the peacebuilding architecture. In accordance with the Terms of Reference endorsed by both the General Assembly and the Security Council, the Advisory Group of Experts will undertake country studies in Burundi, Central African Republic, Sierra Leone, South Sudan, and Timor-Leste. The Advisory Group of Experts is expected to submit a report to the General Assembly and the Security Council for consideration through an intergovernmental process managed by co-facilitators appointed by the two principal organs. The intergovernmental process should be concluded with a concurrent decision by both organs before the end of 2015.